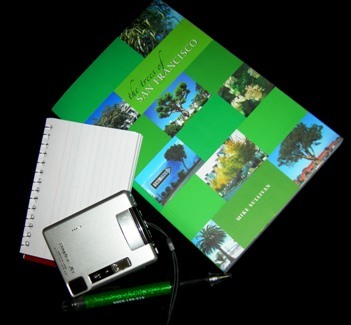 On the Landmark Tree Tour I wrote about recently, they were passing around an interesting book with a green cover: The Trees of San Francisco. “Mike Sullivan never met a tree he didn’t like…” said the inside flap, about the author. And he called eucalyptus “Australia’s gift to California” (though he takes a neutral position on the Sutro Forest issue). It was full of photographs and descriptions of San Francisco’s street trees. I had to have this book. It arrived today and it’s even better than I thought. The descriptions are lucid and easy to read. The photographs (by Jaime Pandolfo, a Brazilian resident of San Francisco) are beautiful; some are so artistic you can almost imagine them as posters. And it includes a whole bunch of walking tours, laid out by neighborhood and noting the special trees. Unfortunately, some of those trees are now not what they were, as storms have taken their toll. A picture of the city’s Christmas Tree – a Monterey Cypress – in front of McLaren Lodge in Golden Gate Park shows the tree in its heyday; today, it’s sadly diminished as large branches have fallen off. But many of the trees are even bigger. And with all the new trees being planted, we hope later editions of this book will still have thousands of trees to celebrate. Meanwhile, Mike Sullivan has a convenient website at sftrees.com that includes some updates to his book. Mike is great, not only does he know about trees but he also knows a lot about San Francisco politics. I used to be on the board of Plan C with Mike, which is a group that advocates for quality of life in the city. It’s good to hear that his book is still making the rounds!